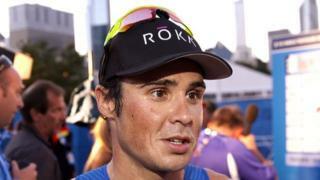 Javier Gomez says winning his third successive World Triathlon Series title at the Grand Final in Chicago is "more than I ever dreamed". The Spaniard also becomes the first male triathlete to claim five world championship titles, and now says his "main goal" is securing gold at the 2016 Olympics in Rio. The race was won by his compatriot Mario Mola with South Africa's Richard Murray in third place. Great Britain's Jonny Brownlee finished 12th on his return from injury.